August 24, 2011 – RAMP’s 21st Annual Changing Attitudes Breaking Barriers Luncheon will be Thursday, October 6, 2011, 11:45 a.m. at Cliffbreakers, 700 W. Riverside Boulevard in Rockford and features keynote speaker, Stevie Hopkins, Director of Awesomeness at 3E Love. Stevie Hopkins is the Director of Awesomeness at 3E Love, the disability awareness clothing line and marketing company that he co-founded along with his sister Annie, shortly before her untimely death. When Annie created the powerful symbol, that later became the tattoo on her shoulder, little did they know it would become a phenomenon and recognized worldwide as the international symbol of acceptance. Stevie is an entrepreneur who holds two degrees from theUniversityofIllinois. He also happens to use a wheel- chair due to Spinal Muscular Atrophy which is the inspiration and driving force behind his social acceptance campaign which he says, “starts with something very basic…I love who I am, and it’s okay to talk to me and get to know me. I may be different but I have something to offer this world.” Stevie’s mission is to teach people the 3 E’s, to embrace living life no matter the obstacles and by doing so, educate society and empower those with disabilities to love life. RAMP’s Luncheon seeks to entertain and educate a broad range of people. The desired result is for people who attend to be more aware and supportive of RAMP’s mission – to promote an accessible society that allows and expects full participation by people with disabilities. The Luncheon also provides RAMP the opportunity to inform and update the community on our current efforts and successes. If you are interested in becoming a luncheon sponsor or wish to purchase tickets (by table $300 for a table of 8 or individually $40) please contact RAMP (815)968-7467 or for more information and a registration form click here. Before the luncheon, disabilityworks invites you to a free Building Better Business Workshop on the successful inclusion of people with disabilities in the workforce. For more information please contact Linda Sullivan, (312)550-8532 or lsullivan@chicagolandchamber.org. RAMP is a passionate partner for people with disabilities desiring to live a useful and rewarding life. RAMP empowers people with disabilities to realize there are no limits to what they can do. This is accomplished by assisting them to live independently, make changes in their lives, seek peer support, obtain resources and remove barriers that threaten their dreams of independence. RAMP advocates the implementation of current laws, promotion of needed legislation and improvement of existing systems for persons with disabilities while working to diminish negative attitudes that threaten to impede equal access. RAMP advocates for and serves people with disabilities out of four offices located in Boone, DeKalb, Stephenson andWinnebagoCounties. Typically the wheel-a-thon has been held on a Saturday morning. This year’s wheel-a-thon will be held in the evening on Thursday, July 28th. Registration begins at 4:30pm, the Wheel-A-Thon is at 5:30pm with dinner and awards at 6:30pm. In the past we have asked that teams or individuals to use a wheelchair to understand the challenges people with disabilities may face wheelchair users face on a daily basis. This year, in addition to teams using and decorating a wheelchair, we want you to show us how you roll at the 12th Annual Freeport Wheel-A-Thon whether it’s walking, skating, wheeling, scooting, running, strolling or biking. The past few years we have had a downtown route and this year we will be atKrapePark,1799 South Park BoulevardinFreeportfor a fresh new route. This is a fun, family friendly event so don’t delay, register your team for the Freeport RAMP Wheel-A-Thon and start raising funds today! We encourage local companies and organizations to gather friends, family and co-workers to form teams and raise funds for RAMP. Need ideas on how to raise funds – contact Tiffany Vondra at RAMP (815)233.1128. The Wheel-A-Thon supports RAMP’s mission to promote an accessible society that allows and expects full participation by people with disabilities. Organize a team for friendly competition and earn great incentives from local area businesses! Visit our fun easy to use Wheel-A-Thon website at www.FreeportWheelathon.kintera.org to sign up your team, sponsor a wheeler or make a donation. Sponsorship opportunities are available! Contact Tiffany Vondra, Stephenson County RAMP Manager at (815)233-1128 or tvondra@rampcil.org to find out more ways to help. All proceeds from the Wheel-A-Thon will benefit RAMP’sStephensonCountyservices provided out of theFreeportoffice. RAMP is a passionate partner for people with disabilities desiring to live a useful and rewarding life. RAMP empowers people to realize there are no limits to what they can do. This is accomplished by assisting people with disabilities to live independently, make changes in their lives, seek peer support, obtain resources and remove barriers that threaten dreams of independence. RAMP advocates the implementation of current laws, promotion of needed legislation and improvement of existing systems for persons with disabilities while working to diminish negative attitudes that threaten to impede equal access. Rockford RAMP Wheel-A-Thon This Saturday Morning! June 24, 2011 – Tomorrow, June 25th we want you to show us how you roll at the 23rd Annual Rockford Wheel-A-Thon whether it’s walking, skating, wheeling, scooting, running, strolling or biking. This is a fun, family friendly event so don’t delay, register your team for the Rockford RAMP wheel-a-thon and start raising funds today! Registration begins at 9am, the Wheel-A-Thon is at 10am with lunch and awards at 11am. The Wheel-A-Thon begins at the Trolley Station in Riverview Park by the downtown Rockford RAMP office, 202 Market Street. We encourage local companies and organizations to gather friends, family and co-workers to form teams and raise funds for RAMP. Need ideas on how to raise funds – contact Amy Morris at RAMP (815)968-7467. The Wheel-A-Thon supports RAMP’s mission to promote an accessible society that allows and expects full participation by people with disabilities. Organize a team for friendly competition and earn a t-shirt, Magic Waters passes, McDonald’s coupons and Rockford Riverhawks tickets! Visit our fun easy to use Wheel-A-Thon website at www.RockfordWheelathon.kintera.org to sign up your team, sponsor a wheeler or make a donation. Sponsorship opportunities are available! Contact Amy Morris, RAMP Development DIrector at (815)968-7467 or amorris@rampcil.org to find out more ways to help. SupplyCore is conducting a raffle on behalf of RAMP to raise funds for their Wheel-A-Thon team. Tickets are just $2 each or 6 for $10 and can be purchased on Friday, June 24th at the Rockford City Market by visiting RAMP’s porch, 202 Market Street from 2:00-8:00p.m. and Saturday, June 25th at the Wheel-A-Thon located near the RAP office at the downtown Trolley Station from 9-11am. For more information contact Deb Rogers, drogers@rampcil.org or 815.968.7467. Raffle Items include: 1st Place – 4 diamond box tockets to the Milwaukee Brewers vs. Cincinnati Reds on July 9th at 6:10pm which includes parking and Stadium Club Passes, 2nd Place – $100 Visa Gift Card and two 3rd Place – $50 Gas Cards. All proceeds from the Wheel-A-Thon will benefit RAMP’sWinnebagoCountyservices provided out of theRockfordoffice. 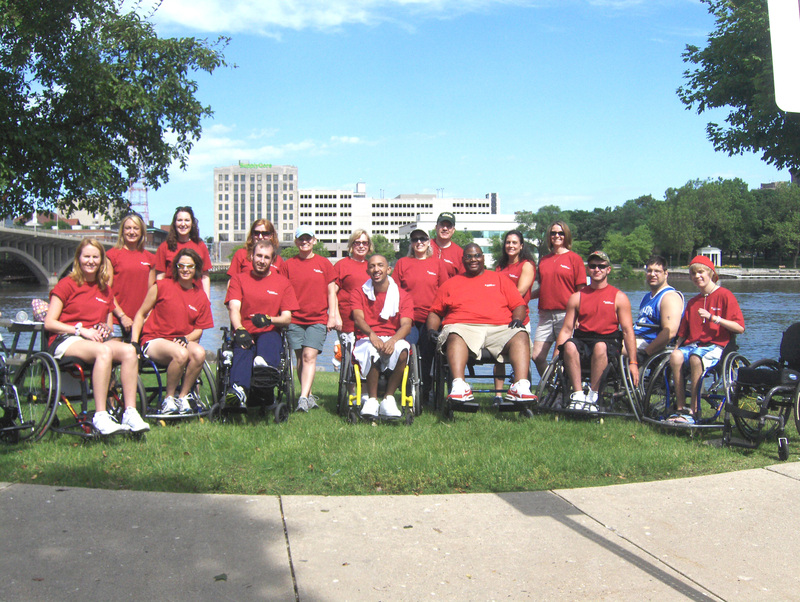 RAMP is a passionate partner for people with disabilities desiring to live a useful and rewarding life. RAMP empowers people to realize there are no limits to what they can do. This is accomplished by assisting people with disabilities to live independently, make changes in their lives, seek peer support, obtain resources and remove barriers that threaten dreams of independence. RAMP advocates the implementation of current laws, promotion of needed legislation and improvement of existing systems for persons with disabilities while working to diminish negative attitudes that threaten to impede equal access. For more information about RAMP call (815)968-7467, visit our website www.rampcil.org, or the Wheel-A-Thon event website to register your team today www.rockfordwheelathon.kintera.org. June 22, 2011 – This Saturday, June 25th we want you to show us how you roll at the 23rd Annual Rockford Wheel-A-Thon whether it’s walking, skating, wheeling, scooting, running, strolling or biking. This is a fun, family friendly event so don’t delay, register your team for the Rockford RAMP wheel-a-thon and start raising funds today! Registration begins at 9am, the Wheel-A-Thon is at 10am with lunch and awards at 11am. The Wheel-A-Thon begins at the Trolley Station in Riverview Park by the downtown Rockford RAMP office, 202 Market Street. We encourage local companies and organizations to gather friends, family and co-workers to form teams and raise funds for RAMP. Need ideas on how to raise funds – contact Amy Morris at RAMP (815)968-7467. The Wheel-A-Thon supports RAMP’s mission to promote an accessible society that allows and expects full participation by people with disabilities. On Saturday, June 25th we want you to show us how you roll at the 23rd Annual Rockford Wheel-A-Thon whether it’s walking, skating, wheeling, scooting, running, strolling or biking. This is a fun, family friendly event so don’t delay, register your team for the Rockford RAMP wheel-a-thon and start raising funds today! Registration begins at 9am, the Wheel-A-Thon is at 10am with lunch and awards at 11am. The Wheel-A-Thon begins at the Trolley Station in Riverview Park by the downtown Rockford RAMP office, 202 Market Street. We encourage local companies and organizations to gather friends, family and co-workers to form teams and raise funds for RAMP. Need ideas on how to raise funds – contact Amy Morris at RAMP (815)968-7467. The Wheel-A-Thon supports RAMP’s mission to promote an accessible society that allows and expects full participation by people with disabilities. 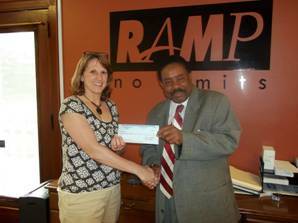 RAMP requested funds from the DeKalb County Community Foundation towards the completion of the renovation and were appreciative to receive $1,500 from the DeKalb County Community Foundation. RAMP is still completing smaller projects in the new office as funding is available. Dr. Larry Bolles, a Board Member from the DeKalb County Community Foundation. – Interested in learning more about Fibromyalgia? Billy Meyers in conjunction with RAMP invites anyone including health professionals, care takers, family, or individuals with Fibromyalgia to join the Fibromyalgia Support Group. The support group will meet on Tuesday, May 24, 2011, 6:30pm at New Horizons Counseling, 34 N. Whistler in Freeport. The purpose of this group is to provide support and resources for those with Fibromyalgia as well as their family and friends. The group will alternate months between having educational speakers and group members sharing their own experiences. If you or someone you know has fibromyalgia and you would be interested in learning more about the condition and developing a network of support please join us for this meeting.